Terriers head to North Andover to begin a home-and-home series against Merrimack. Puck drop is at 7 p.m.
Last season,BU defeated Merrimack in all three regular season games and then swept the Warriors in the Hockey East quarterfinals. Merrimack (3-9-1) has struggled offensively, especially with Hockey East first team all-star Mike Collins sidelined in recent games. However, in their last outing, the Warriors took defending national champion Yale to overtime, before dropping a 3-2 decision. Goalie Rasmus TIrronnen comes in with a stingy 2.17 goals against average. BU, which is looking to build off recent wins against North Dakota and Cornell as it returns to conference play, has had good contributions from several members of its large freshman class. Robbie Baillargeon is tied for the team lead in points with 11. 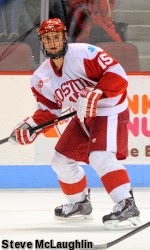 He and classmate Nick Roberto (photo) are tied with Danny O’Regan for most goals with five. Rookie blueliners Doyle Somerby and Dalton MacAfee have made a generally smooth transition to Division 1 play. ►Tomorrow night’s game at Agganis Arena will feature the Ninth annual Teddy Bear Toss to benefit Boston Children's Hospital and other local charities. ●The Teddy Bear Toss has been perfected by the fans of the Calgary Hitmen. Kevin Shattenkirk recorded his 17th and 18th assists of the season in the Blues' 5-1 thumping of the Islanders. The Los Angeles Times profiles former BU captain and Anaheim Ducks center Nick Bonino, discussing his multi-sport childhood and his role in BU's 2009 NCAA championship game comeback for the ages. #9 Terriers begin a two game homes series against WCHA power Minnesota Duluth tonight. Puck drop is at 5 p.m. Tomorrow’s game starts at 3 p.m. At Walter Brown Arena. BU is 12-3-1 overall and has won 10 of the past 12 games. The Bulldogs, five-time NCAA champs, have a 7-6-3 record. Last season the teams played twice in Duluth, both ending in ties, including the only scoreless tie in BU’s history. Senior captain Louis Warren and sophomore Sarah Lefort each have 10 goals to lead BU. The visitors’ top scorer is Jenna McParland with 16 points; top goal-scorer is Jamie Kenyon with seven.